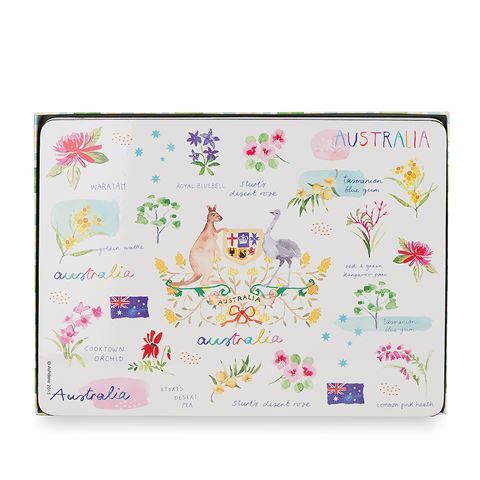 Hailing from Ashdene’s fantastic Australia Down Under collection – inspired by some of our country’s most iconic sights – the Australia Down Under Placemats are sure to look at home at your dinner table. With lovingly designed illustrations from Logina Phillips, these placemats feature some of Australia’s most well-loved plant-life as well as the country’s coat of arms. There’s no better to celebrate our country’s rich culture and history than with these cork backed placemats. Australia inspired illustrations by Logina Phillips. Clean with a damp cloth and dry with a soft towel. Presented as a set of four in an Ashdene gift box. Dimensions: 30cm (l) x 23cm (w).